Normally, club officials are keen to downplay the prospects of new recruits. Even if they’re secretly excited, they’re wary about placing too much pressure on a youngster. That is some wrap. And even though things didn’t quite work out that way in the end, it was hardly Ken’s fault. Ken Williams was a brilliant footballer with Yallourn Blues. Tall, strongly built and a beautiful kick, he was capable of playing at either end of the ground, and most often filled key positions. A local boy who was the brother of Melbourne’s famed Geoff Williams, Ken first played senior football as a 16-year-old, having graduated from the Yallourn Imperials. He immediately became a regular, missing only one game in his first five seasons (and that was only because of the death of a family member). 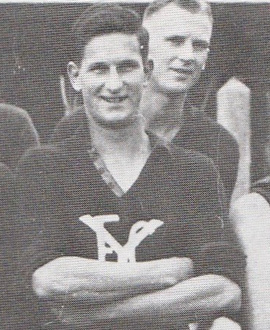 When the Yallourn team, which had been playing in the Gippsland League, divided into two teams, he joined the Blues. A year later, after a Premiership with the Blues in 1939 and a blistering start to the next season, Collingwood came calling. He missed the first couple of games before debuting with the seconds, and after just one game there he was chosen for the seniors against Melbourne in the fifth round. And so it proved. He kept his place for 12 games straight, only missing the last couple of the year after suffering a knee injury. He played mostly as either a half-back flanker or at centre half-back to start with (The Age noted that he had been ‘particularly solid’ as a defender), and was even shifted forward later in the season and kicked a couple of goals. He had done exceptionally well in that first year, and a big career seemed assured. But almost as soon as his VFL season was prematurely ended by the knee injury he was back in Yallourn and enlisting in the AIF. He served from April 1941 to December 1945, mustered as a coppersmith. He saw service in the Middle East, New Guinea and the South West Pacific. That service saw the end of Ken Williams’ VFL career. Instead he returned to Yallourn, where he enjoyed a long working life with the State Electricity Commission. But there must have been times where he’d wondered what might have been if not for the Second World War. He still mightn’t have become “one of the greatest players of all time”, but it would surely have been rewarding to see how good he could have been.